I was in Seattle recently and had the opportunity to take in a lot of the culinary delights the city has to offer. One of the absolute standouts was Beecher’s Handmade Cheese. 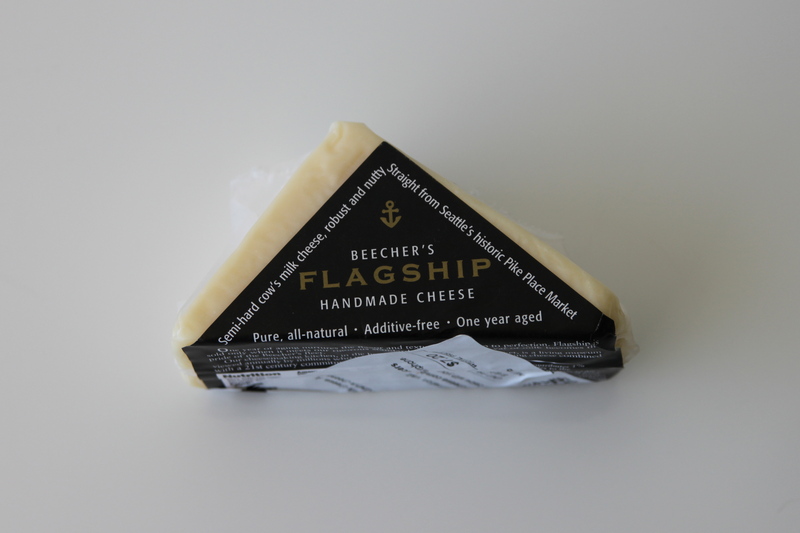 Beecher’s has all sorts of delicious varieties, but their white cheddar is truly something special. I was content eating one package of their white cheddar on its own as it is so good; but, I wanted to cook with it in some form. So I came up with this Roasted Broccoli & White Cheddar Soup. No cream or milk is used, I substituted low-sodium chicken broth, and its filled with vegetables making for a hearty but healthy soup. The white cheddar will add plenty of depth and richness to perfectly complement your vegetables. This is the kind of soup to eat as winter turns into spring. This cheese also makes for great Mac & Cheese. It’s available online here. This is Green Garlic–it’s simply immature conventional garlic so it has a milder flavor but still that great garlicky taste. It tastes somewhat like a combination of garlic, green onions and leeks. In season now! Look for the best broccoli you can find–it should feel heavy in your hand and the stalks should be firm. This is where the flavor comes from–cook this down. Serve warm. I always make enough to freeze and have for the future. Sprinkle with fresh chopped parsley and fresh ground pepper. Enjoy! It’s hearty, nutritious and filling. 1) Turn oven to 400 F. While the oven is heating, wash broccoli. Dry well. 2) Line two baking sheets with aluminum foil. Then, chop broccoli crowns into florets. You do not need to make them bite size as they will eventually be blended with the rest of the ingredients. Use the stalks as well! 3) Place the broccoli florets and stalks in a mixing bowl. Top with sea salt, fresh ground pepper, and Herbs de Provence. Cover with 1 Tbsp. of olive oil and mix well. Remove from mixing bowl and place on the baking sheets in a single layer. Bake at 400 F for 15 minutes. 4) Remove the broccoli from the oven and top with juice of one lemon. Let cool. It should be tender but not cooked completely! You are just roasting it to concentrate its flavor. It will be cooked further with other ingredients later. 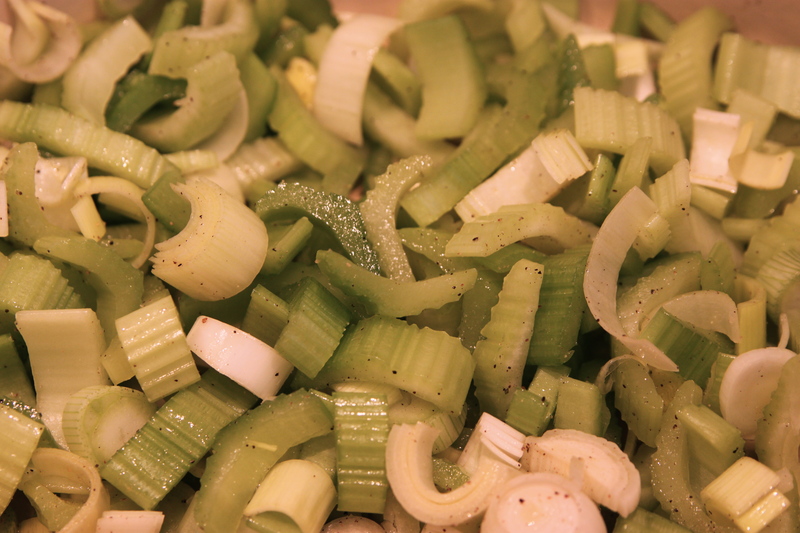 5) Wash celery, green garlic and leeks. Let dry. Then chop each into similar sized pieces (see the picture above). The vegetables should be chopped so that they will cook evenly while sautéing. You do not want to use the upper green portion of the leeks, nor do you want to use the upper green portions of the green garlic. Both are very tough and do not have the flavor found in the vegetables’ more tender flesh areas. 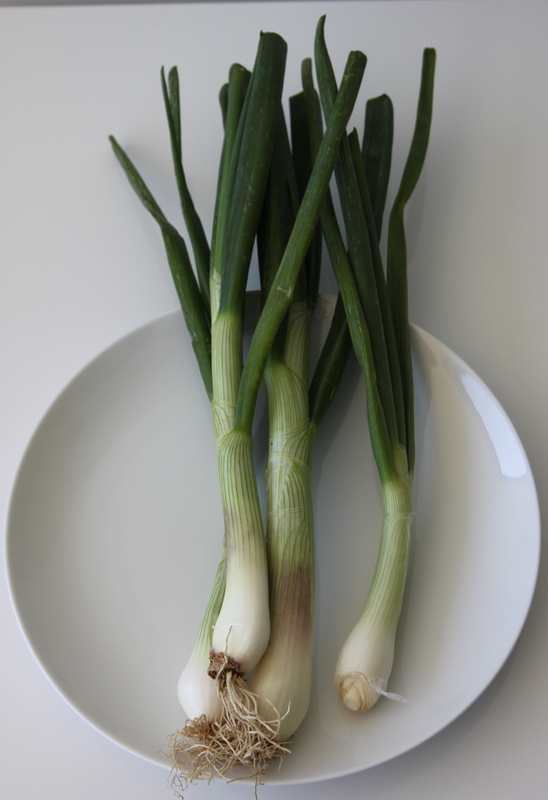 6) Place the chopped celery, green garlic and leeks in a large french oven or pot. Turn heat to medium-high and top with 1 Tbsp. of olive oil, sea salt and fresh ground pepper. Cook until vegetables begin to brown slightly while stirring constantly. 7) Once the vegetables have slightly browned and become tender, add 1/2 of the chicken broth. Stir and bring to a boil. 8) Then, add broccoli and second 1/2 of the chicken broth to the hot mixture. Stir and bring to a boil. 9) Once it reaches a boil, immediately reduce heat to low. You should simply have a nice simmer going and the vegetables should now be tender. Then, using an immersion blender or food processor blend the mixture until it is smooth. I like mine to have a bit of chunkiness to it for texture, but it is also great completely smooth. 10) While the blended mixture is simmering, grate the white cheddar. 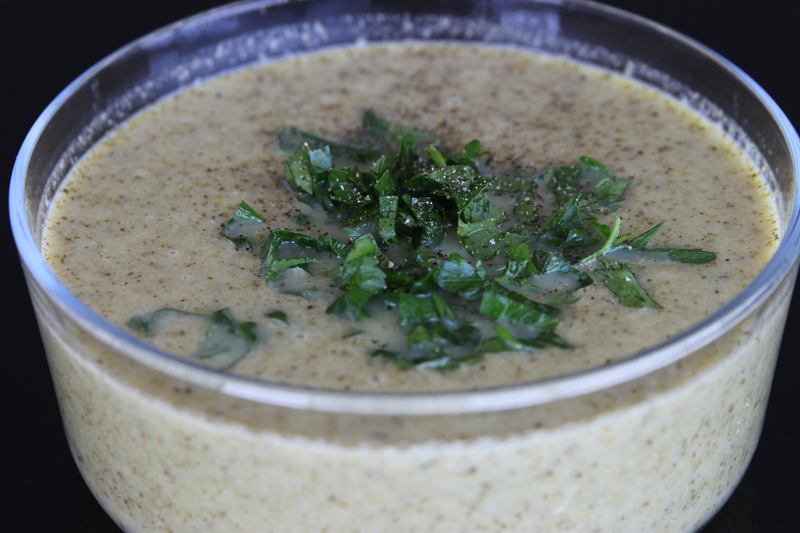 Slowly pour the grated cheddar into the soup while stirring and continuing to cook on low. Stir until it is completely incorporated and melted. 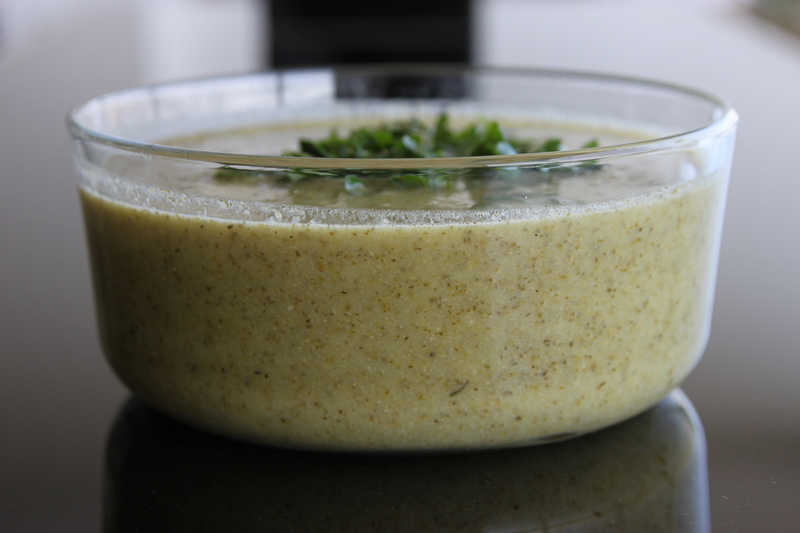 11) Pour soup into bowls, top with fresh parsley and a bit of fresh ground pepper. Freeze any extra for a weeknight.